The roots of modern cold laser applications can be traced back to 1916, when Albert Einstein conceived the theory of Light Amplification through Stimulated Emission of Radiation, or LASER. In 1967, Professor Andre Mester began testing low power lasers for wound healing. He is recognized by many as the grandfather of laser therapy. Today, over 10,000 practitioners in 30 countries are using cold laser technology to reduce pain and help people return to wellness. From professional athletes, to senior citizens struggling with chronic arthritic pain, all can realize relief through the natural healing powers of light. 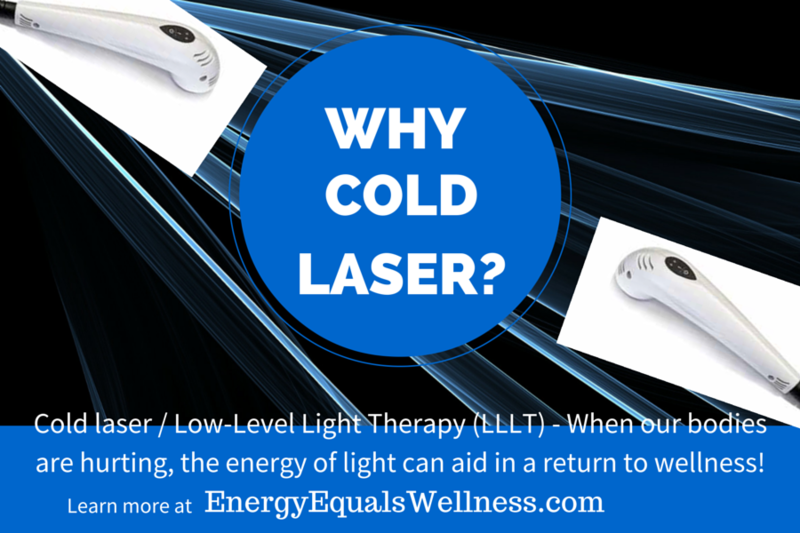 The effectiveness of cold laser / low-level light therapy is supported by over 4,000 clinical studies. Cold Laser / Low-Level Light Therapy (LLLT) uses light energy to boost the body’s natural healing capabilities. When a laser light source lightly contacts the skin, light energy flows painlessly into the body to reach damaged cells and tissue. The light energy encourages tissue repair, pain reduction, and accelerates the resolution of inflammation. The near infrared light emitted by a cold laser’s LED diodes delivers energy in the form of photons to cells throughout the application area. Cells convert this energy into ATP (adenosine triphosphate). ATP provides the fuel our cells need to regenerate and heal. Additionally, the photons of light energy delivered by the cold laser stimulate the body to send positive ions to the application area, which in turn results in the relief of pain. How Is Cold Laser Applied? Energy Equals Wellness, LLC has state-of-the-art Laser and LED Light technology equipment capable of delivering the beneficial properties of both Red and IR light simultaneously. Our high-powered, professional-grade cold laser equipment applies the required wavelengths of light through targeted handheld probes for small application areas, and dual 5 x 7 inch light pads for larger areas. The probes and/or light pads simply need to lightly touch the skin above the application area. 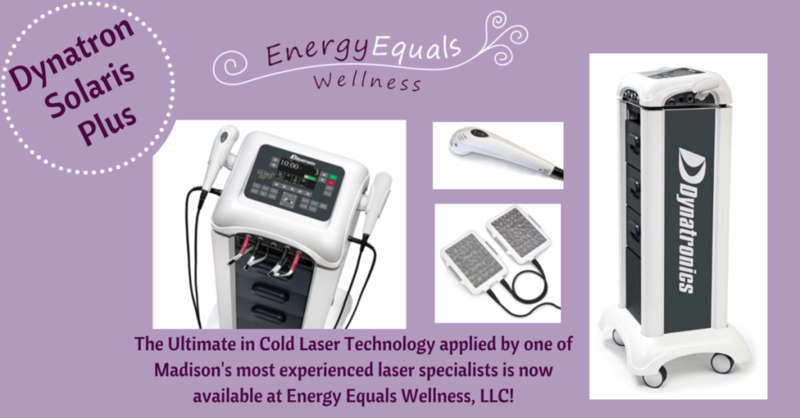 At Energy Equals Wellness, one of Madison’s most experienced laser specialists administers all cold laser applications. 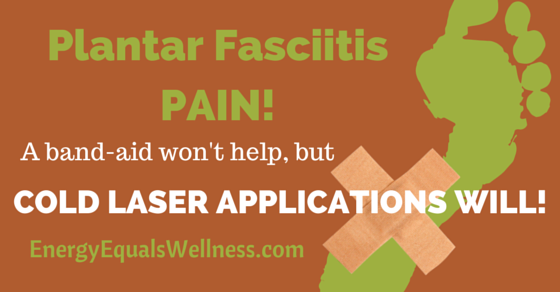 Applications are fast (typically 15-20 minutes), completely pain-free, and most importantly—affordable! 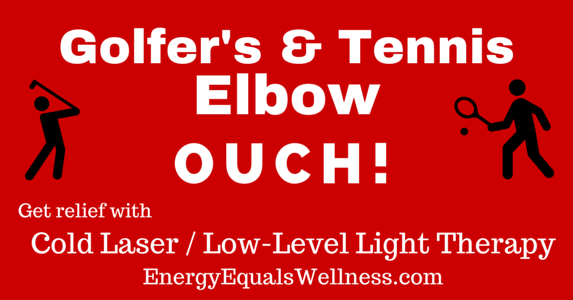 Cold laser / low-level light applications encourage tissue repair, and the reduction of pain and inflammation. When our bodies are hurting, the energy of light can aid in a return to wellness. What will I feel during an application? First off, you will not feel pain or discomfort. Cold laser applications are physically noninvasive, only light passes through your skin to reach damaged cells, or aching joints and muscles. A small percentage of people will feel a comforting warming sensation; most will feel nothing at all. Side effects have proven to be virtually non-existent. Occasionally, you may temporary feel elevated discomfort in a wounded area as the body works to return that area to a state of wellness. How often and how many times will the cold laser need to be applied? Most people experience results within 3-6 applications over a period of 1-3 weeks. Chronic or long-standing conditions may require additional applications over an extended period of time. Do I need to take any special precautions or time away from work? Cold laser applications are pain-free and generally require no post application regimen or special care. The only standard recommendation is an increase of water intake for a day or two following each cold laser application. 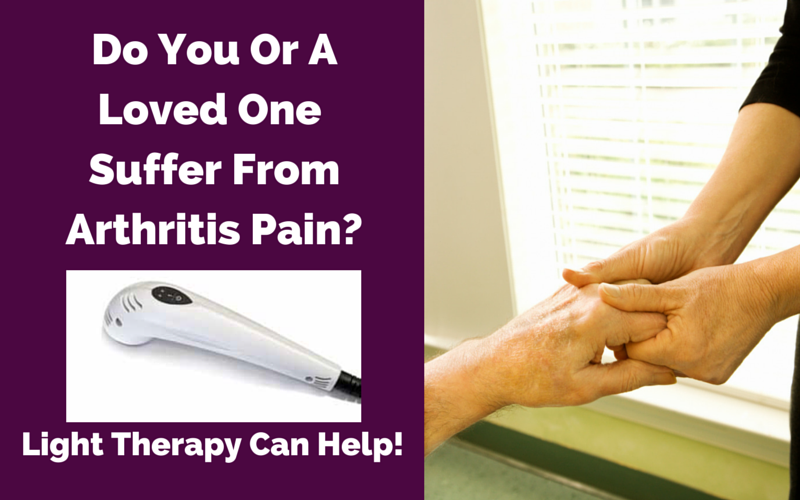 Cold laser increases circulation, which encourages the body to flush toxins from damaged and hurting areas. Increased water consumption will help the body with this process. For temporary relief, you may apply ice to any application area where you feel discomfort. These rare instances are not caused by the laser application itself, but by the body as it naturally begins returning the wounded area to a state of wellness. We have collected information on cold laser / low-level light therapy from leading experts. You’ll find a wealth of information HERE! Unless otherwise noted, any statements made have not been evaluated by the Food and Drug Administration. The information herein is not intended to diagnose, treat, cure or prevent any disease, nor do we make or intend to infer any such claims.